For more than five decades, the Oregon chapter of the Nature Conservancy has been making a big difference across the state. But in Portland, where the chapter is based, its presence in a nondescript circa-1970s building on Southeast 14th Avenue was rarely noticed by passersby. That will likely change next year, when the group moves into a building that's been designed and renovated to both support the organization's mission of conservation and stewardship. As forward thinking as the Nature Conservancy's mission is, its headquarters building was a different story. The three-story,12,000-square-foot building had outlived its usefulness. The roof leaked. The windows let in cold air. The building even had five separate systems for heating, ventilation and air conditioning. "It had reached a point where it needed a bunch of investment," said Jim Desmond, state director for The Nature Conservancy. The building's layout also had become inefficient as the chapter had grown over the years. The building was originally used as an office for a grocery store before later being used as a parole office. The space inside was partitioned for "security and privacy," Desmond said. The organization has 85 employees, about half of whom are located in the headquarters building (the remainder work at locations around the state). The chapter's operations are collaborative by nature, with employees often working together and with partners on projects. Only one conference room in the building could accommodate a large group, and that was limited to about a dozen people. Realizing it was time to make a choice about what to do with the headquarters building, the organization looked at three options. The first option was to tear down the existing building and construct a new structure. There was enough room on the property to accommodate a 75,000-square-foot building that would have allowed the organization to rent out part of the space as a money-making venture. However, the organization's leaders and its board members didn't feel building a large structure was the right step. The property sits on the edge of a residential area and the group felt it would be out of line with the group's commitment to stewardship to bring in a structure that didn't align with the existing fabric of the area. The board and the group leaders also nixed an idea to sell the property. The building is in a fast-growing part of Portland, and the chapter also owns the land on which the building sits. "We could have sold it (all) for quite a bit of money," Desmond said. But keeping their commitment to stewardship in mind, he and the board members also realized there was no way to ensure that whomever bought the property wouldn't immediately erect a tall, massive building on the property. That left the third option — to renovate the existing building. It was input from project^, which The Nature Conservancy brought on to help develop and manage the project, and Portland-based LEVER Architecture, as project architect, that helped convince the chapter that working with what they had was the best choice. LEVER's founder, architect Thomas Robinson, believed the existing structure had untapped potential. Once the exterior started to be stripped away, the project team realized they had what Tom Cody, managing partner of project^, calls a "jewel" of a building. When the skins of older buildings are removed the almost always reveal surprises, according to Robinson. "This one was a pleasant surprise," he said. "The building is actually a mass-timber building. It was built at a time when people built buildings out of wood, but they covered it up. "One of the most sustainable aspects of the project was reusing that structure," he added. Even with good bones, the building needed to be stripped down to little more than the foundation and frame. "We gutted it and then reinvented it," Robinson said. For the project team, which included local engineering firms KPFF and PAE and Lease Crutcher Lewis as contractor, that reinvention consisted of turning the building and the property into a showcase for The Nature Conservancy's projects across the state. Rocks for landscaping would come from one site. Wood for the building itself would come from another. "By visiting The Nature Conservancy in Portland, you (will), in a way, explore their work far away," Cody said. "It takes the visitor on a journey around the state." On the exterior of the building, for example, the lower portion will feature juniper cladding, made from trees collected from the chapter's rangeland restoration work at its Juniper Hills Preserve in Eastern Oregon. The upper part of the building will be re-clad with weathering steel, which Robinson said will "change over time and eventually feel like it has been there for a long time." The interior of the building will be a study in collaboration. Because the building originally served as offices for a local supermarket chain, it was filled with small offices. The renovation will open up the interior space, creating a floor plan without closed offices. Instead, there will be some small private spaces for meetings and phone calls. Juniper will make another appearance inside the building in the form of the front reception desk. The project, which eventually will be dubbed the Oregon Conservation Center, also features an expansion component, a new pavilion that will sit at the corner of Southeast 14th Avenue and Belmont Street. The structure, which will be used for lectures and other events, will be made of cross-laminated timber, made by gluing pieces of wood together at 90-degree angles to each other and then compressing them to create a lightweight, strong panel. 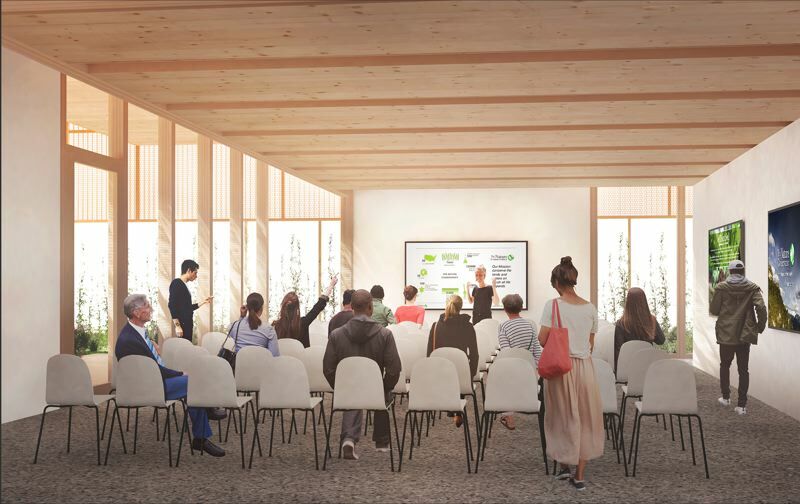 While CLT is becoming more common for projects, the panels in the pavilion are unique in that they are among the first in the country to be made using wood certified by the Forest Stewardship Council. The designation verifies the wood was grown and harvested in accordance with a set of highly sustainable guidelines. 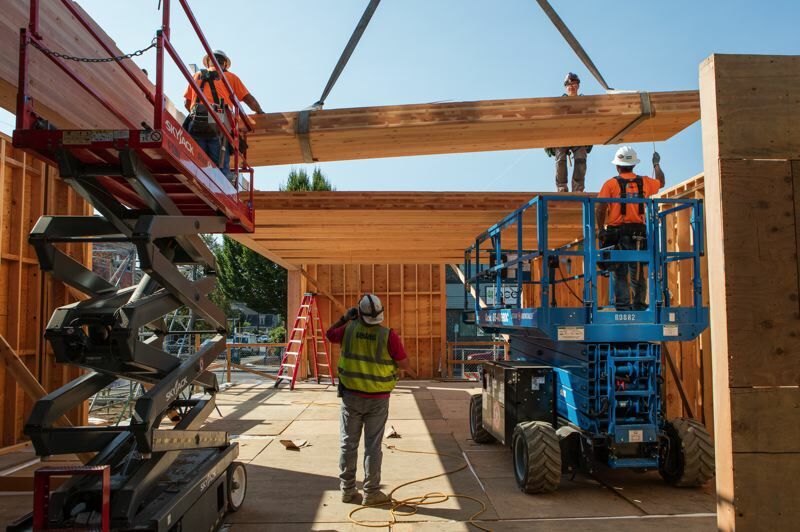 The project team worked with the nonprofit Sustainable Wood Northwest to source the wood for the CLT panels as well as for other wood used throughout the building. A rooftop deck on the pavilion will use FSC-certified red cedar from The Nature Conservancy's Ellsworth Creek Preserve. The pavilion also will feature a custom-made, perforated metal rainscreen around the building. The screen, which features a pattern based on foliage, will result in an effect that Robinson says will be similar to sitting under a tree. That connection to nature will extend to the landscaping of the property around the building. The design by Lando and Associates Landscape Architects will incorporate rocks and gravel from one of The Nature Conservancy's restoration projects in the Willamette Valley. Garden areas will feature native plants, and signs throughout will provide information about how the features reflect with the organization's work. It's just one more way to connect the project to the chapter's mission, according to Robinson. "We're bringing to the urban setting what was once here before." The Nature Conservancy is a global organization with a presence in 72 countries and all 50 states in the U.S. The group's efforts focus largely on tackling climate change, protecting land and water, working toward food and water sustainability, and helping build healthy cities. In Oregon, the group has worked for more than 50 years, protecting grasslands and forests across the state. At Winter Lake on the Coquille River, for example, the chapter has worked with ranchers, the Coquille tribe and a water district to upgrade a tide gate system to give ranchers better control of water from the Coquille River to benefit both cattle and juvenile Coho salmon. At Zumwalt Prairie Preserve in Wallowa County, the chapter has used satellite imagery to help ranchers make more sustainable choices when it comes to grazing their cattle. In 2007, the chapter added another role, helping manage marine reservoirs and marine protected areas off the coast. While juniper is a native Oregon plant species, it's become a nuisance in recent years. Natural fire cycles on the high desert, where juniper grows, used to keep the trees in check. However, interruptions in those cycles have led to a boom in the growth. From about 1 million acres in Oregon in the 1930s, juniper now has spread to more than 6 million acres in the state, according to the organization Sustainable Wood Northwest. That resulting abundance of juniper has caused problems on several levels. A single juniper can use as much as 35 gallows of water per day, which means the plant can deplete groundwater supplies and crowd out other plants. That lack of diversity in plants can speed up erosion. The trees also compete with sagebrush, a natural habitat growth for sage grows, and can take a toll on grazing land. Ranchers in Eastern Oregon have tried to keep juniper at bay by clearing and burning it. In the past few years, though, groups like Sustainable Wood Northwest have been restoring areas where juniper is out of control, taking young trees and using them to create new markets. The trees are removed and then prepared for market by small-scale milling operations. Because juniper is naturally resistant to rot and decay it is becoming a popular choice for decks, garden beds and fencing. The rich colors of the wood, from cream to reds to chocolate browns, also is attracting attention for use in residential and commercial projects. Architect Thomas Robinson and his Portland-based firm, LEVER Architecture, have earned national recognition for designs that incorporate mass timber, including cross-laminated timber. Also known as CLT, cross-laminated timber is made by gluing pieces of wood together at 90 degrees and then applying pressure. The end result is a strong panel that's lighter than concrete. 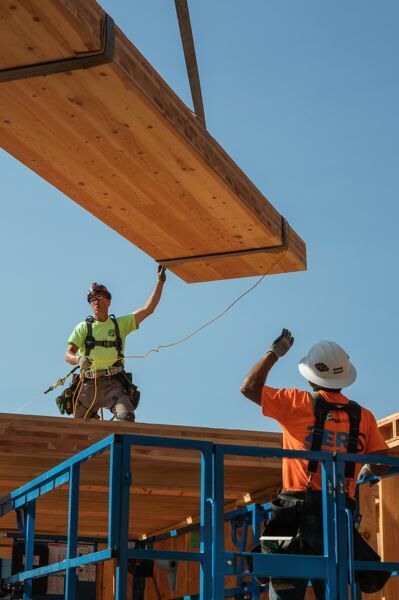 LEVER's 16,000-square-foot Albina Yard project in North Portland was the first project in the country to use domestically produced CLT panels as the primary structural building material. The firm also served as the architect on Framework, the 12-story mass timber building that was expected to become the tallest CLT building in the country. Although the project was placed on an indefinite hold earlier this year, Robinson said he and his team have taken lessons learned designing Framework and incorporated them into new projects, including the Oregon Conservation Center for The Nature Conservancy's Oregon chapter. "You learn how to be innovative. You learn what's possible," Robinson said. "Every project, we're looking for a way to innovate in the context we're working in."